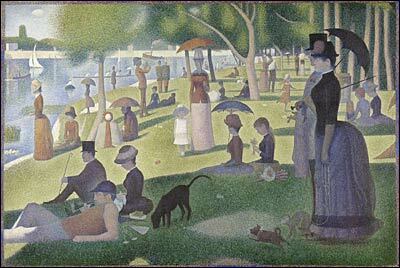 Saturday, June 19 marks the opening of a new Seurat exhibition at the Art Institute of Chicago. Seurat's A Sunday on La Grande Jatte will be showing as well as some of the work he did to prepare for it, including trial-and-error paintings of the neo-impressionist masterpiece. Works by other famous painters such as Rembrandt and Delacroix will also be on display as they were inspirations to Seurat. The exhibition will be open until September 19 and can only be seen in Chicago; it will not travel. This link seems to be a little on the left but I couldn't find a real, credible source for the article. Not that leftist publications aren't "real" or "credible" - they simply, much like publications from the right, have an agenda. For all of those interested in the music industry or trying to sign your "band" to a "major label," I implore you to check out this short essay by famed record producer Steve Albini. He lays out just why signing to a major label is a bad idea in today's music world. DIY for life! For my first entry I would like to quickly ruminate about the state of the British monarchy. We all know that the monarchy in England is a joke. They have been distilled down to but mere figureheads that hold no real power. Granted that when asked if they owe their allegiance to Parliament or the Queen most Britons will declare the Queen their leader, the Royal Family is still an institution of both ridicule and unnecessary pomp. But this is not what really concerns me about the Royal Family. What concerns me is succession. It is quite sad that power may never change hands again in England. The Windsor family has been in power for almost one hundred years and in that near century political power has really been handed over to the people. While this is not necessarily a bad thing, it is almost a slap in the face to history. With my very limited view the Windsor family will always wear the crown. There was a day when a man of ignoble birth could take the crown by force and declare himself King of the Britons. And although I do not condone regicide or bloodshed of any type, I still long for the day that if I really wanted I could become King. People in this country know that when Queen Elizabeth passes away her son Charles will become King. And when Charles' time to pass comes everybody knows Charles' son William will become King. I think this complacency is quite sad. Because world politics are what they are, nobody will ever storm the gates of London again. There will be no fighting in the streets. No bastion from which cannons will be shot. No uprising from the oppressed fieldhands. And I think people are fine with that. But it depresses me. you should try marrying in to the family. then try what they did in nepal.